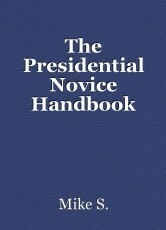 The Presidential Novice Handbook, short story by Mike S.
Great set of rules that our President seems to abide by :) Awesome, piece, Mike. Very, very clever, Mike! How did you get a copy from the White House!